Octane 4.0 has added a tone of new features that have improved workflow and render times immensely. This said, there are a few bugs with it as well, one of which is a laggy stutter that can happen when changing a parameter on a node in a complex node situation. For example, in the bellow image, if I were to change say the Gamma on this Ambient Occlusion texture to something like 2.2, it would update immediately in the live viewer, with no problems. What if though, I instantly see the look of the new changes in my live viewer, and decide I don't like it and want to change the gamma back to 1.25. A lot of times, in a new setup with as many images textures in the scene as this, there will be a very noticeable freez in the whole node interface, where I can not select or change any of the parameters. After this freeze, which normally lasts for about 1-5 seconds, I can then make my change. After I made that change, though, there is a very good chance that this freezing will happen again. From my experience, I would get this freezing about 80% of the time on changing parameters quickly. The cause of this issue is actually not related to the live viewer at all, it's actually the C4D view-port. If you look at the bellow image, you can see that that the C4D view-port "Left", as well as the live viewer "Right", are displaying the texture that I have on it. 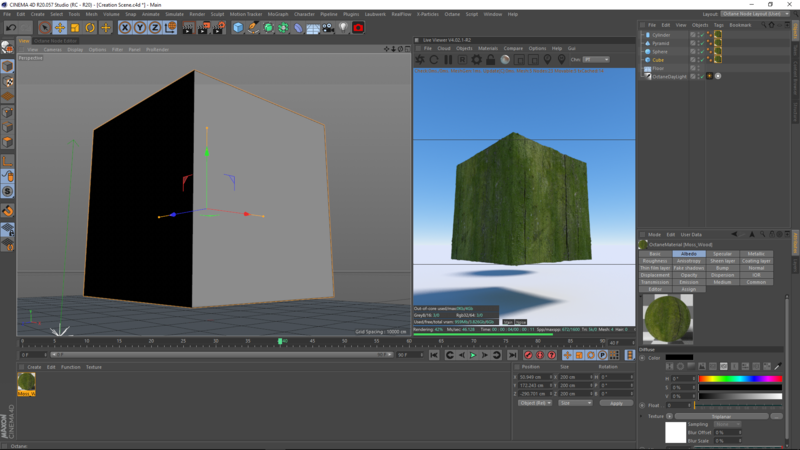 Now, granted, the live viewer is showing the physical correct version of the material, whereas the C4D viewer is showing just an estimated reference of it. This said, every time I make a change to the Octane Material, it has to update that materials new look on both view-ports. 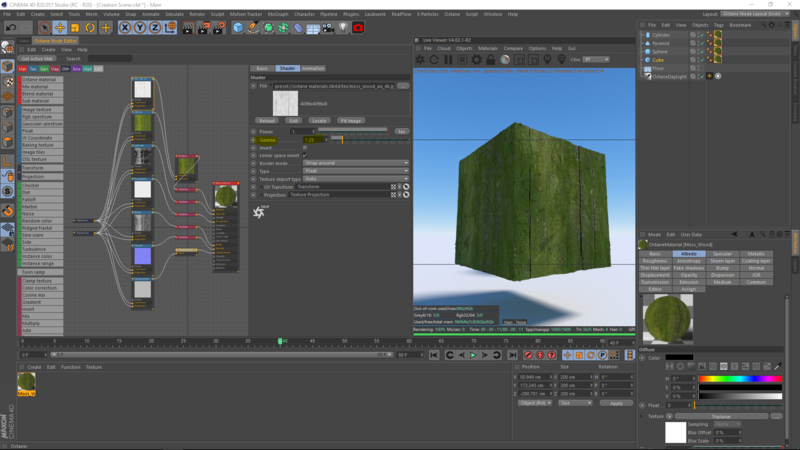 Believe it or not, the lag and time required to update the C4D viewport is much higher than the Octane Live Viewer. 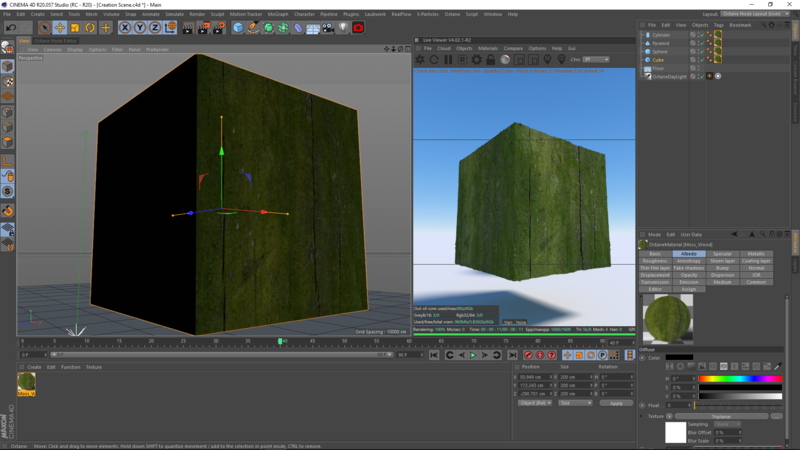 So waiting on the C4D view-port to update when you make a change to your texture is what creates the lag. Fixing this issue is actually a lot easier then you would expect, all you have to do is go into octane settings and then select Settings, and then Other. Once you have done this, simply uncheck the "Use Octane for OpenGL previews" and the freezing issue will be magically reduced by a lot. 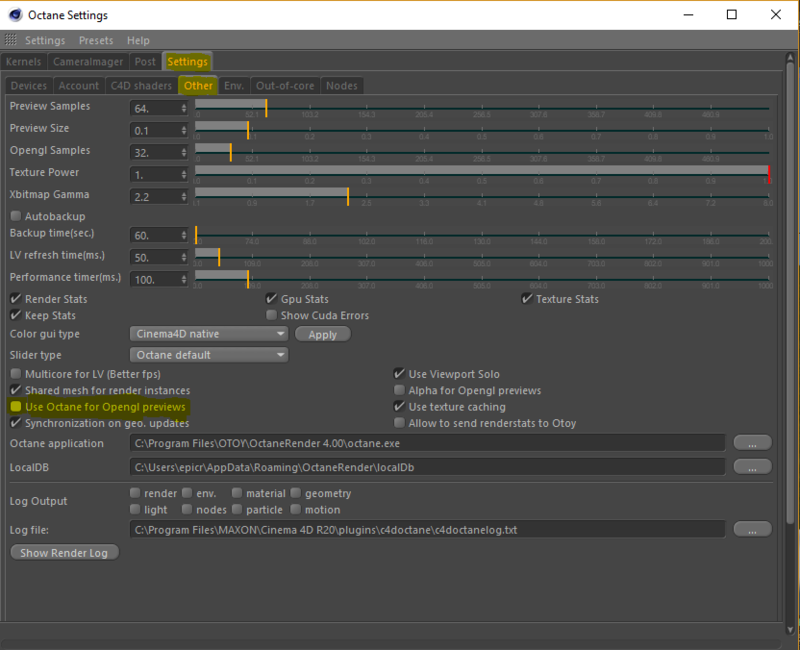 Now, you still can have a few stutters and freezing when changing parameters, because the Octane live viewer still has to update the changes, this said, it will be much much faster then if it was updating the C4D live viewer as well. There is a negative effect to turning off OpenGL previews, and that is loosing the texture reference you get in the C4D view port, "Left". This said, its normally not that big of an issue because you will normally spend most of your time looking at the texture in the Octane Live Viewer "Right". Hope you found this helpful. I normally do videos, but since this issue was such an easy and quick fix, I didn't feel like it was something that needed a video on. This said, if you would rather have a video recorded on this fix, please definitely let me know :)! As always, thank you so much for reading this article, and I look forward to seeing you in the next article/video :)!